Our lighting experts are frequently asked questions about the do’s and don’ts of interior lighting, and one of the most common customer inquiries relates to mixing and matching different light fixtures in a room. While the answer to this question largely depends on your style preferences and the room you are illuminating, we believe that it is possible to tastefully mix and match lighting fixtures with the right approach. 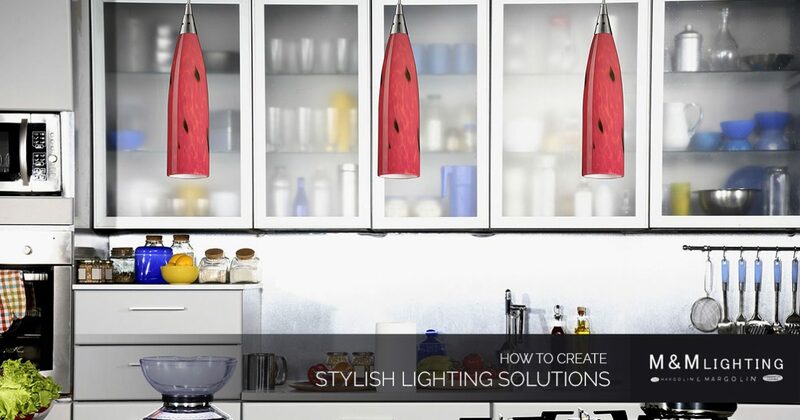 To help you as you begin exploring your lighting options, we have provided six helpful tips below to creating stylish indoor lighting solutions. Read on to learn more! At M&M Lighting in Houston, we have thousands of top-of-the-line products in our Top Rated Local® lighting showroom and our experts would love to speak with you about your design and style preferences. Browse our online catalog now, or stop by our showroom today! When you first begin exploring your lighting options, you may quickly feel overwhelmed by the vast array of products available to you. Because there are so many styles of fixtures, you might be unsure where to start and it can be easy to wind up incorporating too many varieties in one space. In order to keep things simple and avoid a cluttered, confusing design, choose the fixtures that are essential to the room’s ambient lighting first and then choose pieces for task and accent lighting that complement the style of the room. There are three basic types of lighting, and when you successfully incorporate all of them, the result is a perfectly illuminated room. Ambient lighting is the most basic of these three types of lighting as it provides the overall illumination of a space. Chandeliers, ceiling lights, and wall-mounted lights are great for creating this type of lighting. Pendants and track-mounted fixtures are especially useful in adding task lighting to a room, and directional can lights create accent lighting to highlight various features in a room. Installing dimmers and switches that allow you to control each layer of light individually will allow you the flexibility of adjusting the light in the room to meet your needs for any given task. The number one rule of interior design is to ensure that your room has some type of focal point that attracts interest and attention, subtly setting the mood of the space. This can be accomplished by hanging an interesting piece of artwork, installing a unique fireplace surround, or hanging a stunning chandelier. Once you choose your desired focal point, all of your design decisions should be made with it in mind. If your focal point is not a light fixture, you want to be sure that you choose lighting solutions that will complement your focal point, such as track lighting or sconces. While the style and color of the light fixtures you choose are certainly important to the overall design of your space, don’t forget to consider the functionality of a fixture before you purchase it. When you are shopping for lighting, first consider the primary activities that will take place in the room, then research which type of fixtures will strike the right balance between looking great and properly lighting the space. Before you begin to mix and match various fixtures, be sure to pay close attention to the finishes on each. In your shopping ventures, you’re likely to come across everything from brass, bronze, brushed nickel, and silver to wood, crystal, stone, and leather. Choosing the right fixture is important because you don’t want your lighting fixtures to clash with the rest of your interior design choices. If you are uncertain how a specific finish will look in the room, you can always take a picture of it and keep it in the room until you determine whether or not it lends itself to the overall style of the room. While the information found in online articles and manufacturer’s catalogs are important to reference, there is no substitution for expert in-person assistance. A well-qualified lighting specialist will have decades of experience so as to be up to date on all the latest design trends and installation methods. While it can be helpful to have an idea of what you want in mind before calling your local lighting professionals, it is not absolutely necessary. Obtaining assistance from an industry expert will ensure that you get the lighting design of your dreams. Are you a Houston homeowner who is searching for the right lighting solutions for your space? M&M Lighting has more than 50 years of experience and we proudly offer thousands of design options in our online catalog and in our local showroom, and we would love to help you. Contact our team at 713-469-3002 to speak with a lighting expert!